This is a book for readers and for those who wish to become readers. Particularly, it is for readers of books. Even more particularly, it is for those whose main purpose in reading books is to gain increased understanding. By “readers” we mean people who are still accustomed, as almost every literate and intelligent person used to be, to gain a large share of their information about and their understanding of the world from the written word. Not all of it, of course; even in the days before radio and television, a certain amount of information and understanding was acquired through spoken words and through observation. But for intelligent and curious people that was never enough. They knew that they had to read too, and they did read. There is some feeling nowadays that reading is not as necessary as it once was. Radio and especially television have taken over many of the functions once served by print, just as photography has taken over functions once served by painting and other graphic arts. Admittedly, television serves some of these functions extremely well; the visual communication of news events, for example, has enormous impact. The ability of radio to give us information while we are engaged in doing other things—for instance, driving a car—is remarkable, and a great saving of time. But it may be seriously questioned whether the advent of modern communications media has much enhanced our understanding of the world in which we live. Perhaps we know more about the world than we used to, and insofar as knowledge is prerequisite to understanding, that is all to the good. But knowledge is not as much a prerequisite to understanding as is commonly supposed. We do not have to know everything about something in order to understand it; too many facts are often as much of an obstacle to understanding as too few. There is a sense in which we moderns are inundated with facts to the detriment of understanding. One of the reasons for this situation is that the very media we have mentioned are so designed as to make thinking seem unnecessary (though this is only an appearance). The packaging of intellectual positions and views is one of the most active enterprises of some of the best minds of our day. The viewer of television, the listener to radio, the reader of magazines, is presented with a whole complex of elements—all the way from ingenious rhetoric to carefully selected data and statistics—to make it easy for him to “make up his own mind” with the minimum of difficulty and effort. But the packaging is often done so effectively that the viewer, listener, or reader does not make up his own mind at all. Instead, he inserts a packaged opinion into his mind, somewhat like inserting a cassette into a cassette player. He then pushes a button and “plays back” the opinion whenever it seems appropriate to do so. He has performed acceptably without having had to think. As we said at the beginning, we will be principally concerned in these pages with the development of skill in reading books; but the rules of reading that, if followed and practiced, develop such skill can be applied also to printed material in general, to any type of reading matter—to newspapers, magazines, pamphlets, articles, tracts, even advertisements. Since reading of any sort is an activity, all reading must to some degree be active. Completely passive reading is impossible; we cannot read with our eyes immobilized and our minds asleep. Hence when we contrast active with passive reading, our purpose is, first, to call attention to the fact that reading can be more or less active, and second, to point out that the more active the reading the better. One reader is better than another in proportion as he is capable of a greater range of activity in reading and exerts more effort. He is better if he demands more of himself and of the text before him. Though, strictly speaking, there can be no absolutely passive reading, many people think that, as compared with writing and speaking, which are obviously active undertakings, reading and listening are entirely passive. The writer or speaker must put out some effort, but no work need be done by the reader or listener. Reading and listening are thought of as receiving communication from someone who is actively engaged in giving or sending it. The mistake here is to suppose that receiving communication is like receiving a blow or a legacy or a judgment from the court. On the contrary, the reader or listener is much more like the catcher in a game of baseball. Catching the ball is just as much an activity as pitching or hitting it. The pitcher or batter is the sender in the sense that his activity initiates the motion of the ball. The catcher or fielder is the receiver in the sense that his activity terminates it. Both are active, though the activities are different. If anything is passive, it is the ball. It is the inert thing that is put in motion or stopped, whereas the players are active, moving to pitch, hit, or catch. The analogy with writing and reading is almost perfect. The thing that is written and read, like the ball, is the passive object common to the two activities that begin and terminate the process. We can take this analogy a step further. The art of catching is the skill of catching every kind of pitch—fast balls and curves, changeups and knucklers. Similarly, the art of reading is the skill of catching every sort of communication as well as possible. What does active reading entail? We will return to this question many times in this book. For the moment, it suffices to say that, given the same thing to read, one person reads it better than another, first, by reading it more actively, and second, by performing each of the acts involved more skillfully. These two things are related. Reading is a complex activity, just as writing is. It consists of a large number of separate acts, all of which must be performed in a good reading. The person who can perform more of them is better able to read. You have a mind. Now let us suppose that you also have a book that you want to read. The book consists of language written by someone for the sake of communicating something to you. Your success in reading it is determined by the extent to which you receive everything the writer intended to communicate. That, of course, is too simple. The reason is that there are two possible relations between your mind and the book, not just one. These two relations are exemplified by two different experiences that you can have in reading your book. There is the book; and here is your mind. As you go through the pages, either you understand perfectly everything the author has to say or you do not. If you do, you may have gained information, but you could not have increased your understanding. If the book is completely intelligible to you from start to finish, then the author and you are as two minds in the same mold. The symbols on the page merely express the common understanding you had before you met. Let us take our second alternative. You do not understand the book perfectly. Let us even assume—what unhappily is not always true—that you understand enough to know that you do not understand it all. You know the book has more to say than you understand and hence that it contains something that can increase your understanding. What do you do then? You can take the book to someone else who, you think, can read better than you, and have him explain the parts that trouble you. (“He” may be a living person or another book—a commentary or textbook.) Or you may decide that what is over your head is not worth bothering about, that you understand enough. In either case, you are not doing the job of reading that the book requires. That is done in only one way. Without external help of any sort, you go to work on the book. With nothing but the power of your own mind, you operate on the symbols before you in such a way that you gradually lift yourself from a state of understanding less to one of understanding more. Such elevation, accomplished by the mind working on a book, is highly skilled reading, the kind of reading that a book which challenges your understanding deserves. Thus we can roughly define what we mean by the art of reading as follows: the process whereby a mind, with nothing to operate on but the symbols of the readable matter, and with no help from outside,I elevates itself by the power of its own operations. The mind passes from understanding less to understanding more. The skilled operations that cause this to happen are the various acts that constitute the art of reading. To pass from understanding less to understanding more by your own intellectual effort in reading is something like pulling yourself up by your bootstraps. It certainly feels that way. It is a major exertion. Obviously, it is a more active kind of reading than you have done before, entailing not only more varied activity but also much more skill in the performance of the various acts required. Obviously, too, the things that are usually regarded as more difficult to read, and hence as only for the better reader, are those that are more likely to deserve and demand this kind of reading. The distinction between reading for information and reading for understanding is deeper than this. Let us try to say more about it. We will have to consider both goals of reading because the line between what is readable in one way and what must be read in the other is often hazy. To the extent that we can keep these two goals of reading distinct, we can employ the word “reading” in two distinct senses. The first sense is the one in which we speak of ourselves as reading newspapers, magazines, or anything else that, according to our skill and talents, is at once thoroughly intelligible to us. Such things may increase our store of information, but they cannot improve our understanding, for our understanding was equal to them before we started. Otherwise, we would have felt the shock of puzzlement and perplexity that comes from getting in over our depth—that is, if we were both alert and honest. The second sense is the one in which a person tries to read something that at first he does not completely understand. Here the thing to be read is initially better or higher than the reader. The writer is communicating something that can increase the reader’s understanding. Such communication between unequals must be possible, or else one person could never learn from another, either through speech or writing. Here by “learning” is meant understanding more, not remembering more information that has the same degree of intelligibility as other information you already possess. There is clearly no difficulty of an intellectual sort about gaining new information in the course of reading if the new facts are of the same sort as those you already know. A person who knows some of the facts of American history and understands them in a certain light can readily acquire by reading, in the first sense, more such facts and understand them in the same light. But suppose he is reading a history that seeks not merely to give him some more facts but also to throw a new and perhaps more revealing light on all the facts he knows. Suppose there is greater understanding available here than he possessed before he started to read. If he can manage to acquire that greater understanding, he is reading in the second sense. He has indeed elevated himself by his activity, though indirectly, of course, the elevation was made possible by the writer who had something to teach him. What are the conditions under which this kind of reading—reading for understanding—takes place? There are two. First, there is initial inequality in understanding. The writer must be “superior” to the reader in understanding, and his book must convey in readable form the insights he possesses and his potential readers lack. Second, the reader must be able to overcome this inequality in some degree, seldom perhaps fully, but always approaching equality with the writer. To the extent that equality is approached, clarity of communication is achieved. In short, we can learn only from our “betters.” We must know who they are and how to learn from them. The person who has this sort of knowledge possesses the art of reading in the sense with which we are especially concerned in this book. Everyone who can read at all probably has some ability to read in this way. But all of us, without exception, can learn to read better and gradually gain more by our efforts through applying them to more rewarding materials. We do not want to give the impression that facts, leading to increased information, and insights, leading to increased understanding, are always easy to distinguish. And we would admit that sometimes a mere recital of facts can itself lead to greater understanding. The point we want to emphasize here is that this book is about the art of reading for the sake of increased understanding. Fortunately, if you learn to do that, reading for information will usually take care of itself. Of course, there is still another goal of reading, besides gaining information and understanding, and that is entertainment. However, this book will not be much concerned with reading for entertainment. It is the least demanding kind of reading, and it requires the least amount of effort. Furthermore, there are no rules for it. Everyone who knows how to read at all can read for entertainment if he wants to. In fact, any book that can be read for understanding or information can probably be read for entertainment as well, just as a book that is capable of increasing our understanding can also be read purely for the information it contains. (This proposition cannot be reversed: it is not true that every book that can be read for entertainment can also be read for understanding.) Nor do we wish to urge you never to read a good book for entertainment. The point is, if you wish to read a good book for understanding, we believe we can help you. Our subject, then, is the art of reading good books when understanding is the aim you have in view. Getting more information is learning, and so is coming to understand what you did not understand before. But there is an important difference between these two kinds of learning. This distinction is familiar in terms of the differences between being able to remember something and being able to explain it. If you remember what an author says, you have learned something from reading him. If what he says is true, you have even learned something about the world. But whether it is a fact about the book or a fact about the world that you have learned, you have gained nothing but information if you have exercised only your memory. You have not been enlightened. Enlightenment is achieved only when, in addition to knowing what an author says, you know what he means and why he says it. It is true, of course, that you should be able to remember what the author said as well as know what he meant. Being informed is prerequisite to being enlightened. The point, however, is not to stop at being informed. Montaigne speaks of “an abecedarian ignorance that precedes knowledge, and a doctoral ignorance that comes after it.” The first is the ignorance of those who, not knowing their ABC’s, cannot read at all. The second is the ignorance of those who have misread many books. They are, as Alexander Pope rightly calls them, bookful blockheads, ignorantly read. There have always been literate ignoramuses who have read too widely and not well. The Greeks had a name for such a mixture of learning and folly which might be applied to the bookish but poorly read of all ages. They are all sophomores. To avoid this error—the error of assuming that to be widely read and to be well-read are the same thing—we must consider a certain distinction in types of learning. This distinction has a significant bearing on the whole business of reading and its relation to education generally. In the history of education, men have often distinguished between learning by instruction and learning by discovery. Instruction occurs when one person teaches another through speech or writing. We can, however, gain knowledge without being taught. If this were not the case, and every teacher had to be taught what he in turn teaches others, there would be no beginning in the acquisition of knowledge. Hence, there must be discovery—the process of learning something by research, by investigation, or by reflection, without being taught. This is so true, in fact, that a better way to make the distinction clear is to call instruction “aided discovery.” Without going into learning theory as psychologists conceive it, it is obvious that teaching is a very special art, sharing with only two other arts—agriculture and medicine—an exceptionally important characteristic. A doctor may do many things for his patient, but in the final analysis it is the patient himself who must get well—grow in health. The farmer does many things for his plants or animals, but in the final analysis it is they that must grow in size and excellence. Similarly, although the teacher may help his student in many ways, it is the student himself who must do the learning. Knowledge must grow in his mind if learning is to take place. The difference between learning by instruction and learning by discovery—or, as we would prefer to say, between aided and unaided discovery—is primarily a difference in the materials on which the learner works. When he is being instructed—discovering with the help of a teacher—the learner acts on something communicated to him. He performs operations on discourse, written or oral. He learns by acts of reading or listening. Note here the close relation between reading and listening. If we ignore the minor differences between these two ways of receiving communication, we can say that reading and listening are the same art—the art of being taught. When, however, the learner proceeds without the help of any sort of teacher, the operations of learning are performed on nature or the world rather than on discourse. The rules of such learning constitute the art of unaided discovery. If we use the word “reading” loosely, we can say that discovery—strictly, unaided discovery—is the art of reading nature or the world, as instruction (being taught, or aided discovery) is the art of reading books or, to include listening, of learning from discourse. What about thinking? If by “thinking” we mean the use of our minds to gain knowledge or understanding, and if learning by discovery and learning by instruction exhaust the ways of gaining knowledge, then thinking must take place during both of these two activities. We must think in the course of reading and listening, just as we must think in the course of research. Naturally, the kinds of thinking are different—as different as the two ways of learning are. The reason why many people regard thinking as more closely associated with research and unaided discovery than with being taught is that they suppose reading and listening to be relatively effortless. It is probably true that one does less thinking when one reads for information or entertainment than when one is undertaking to discover something. Those are the less active sorts of reading. But it is not true of the more active reading—the effort to understand. No one who has done this sort of reading would say it can be done thoughtlessly. Thinking is only one part of the activity of learning. One must also use one’s senses and imagination. One must observe, and remember, and construct imaginatively what cannot be observed. There is, again, a tendency to stress the role of these activities in the process of unaided discovery and to forget or minimize their place in the process of being taught through reading or listening. For example, many people assume that though a poet must use his imagination in writing a poem, they do not have to use their imagination in reading it. The art of reading, in short, includes all of the same skills that are involved in the art of unaided discovery: keenness of observation, readily available memory, range of imagination, and, of course, an intellect trained in analysis and reflection. The reason for this is that reading in this sense is discovery, too—although with help instead of without it. We have been proceeding as if reading and listening could both be treated as learning from teachers. To some extent that is true. Both are ways of being instructed, and for both one must be skilled in the art of being taught. Listening to a course of lectures, for example, is in many respects like reading a book; and listening to a poem is like reading it. Many of the rules to be formulated in this book apply to such experiences. Yet there is good reason to place primary emphasis on reading, and let listening become a secondary concern. The reason is that listening is learning from a teacher who is present—a living teacher—while reading is learning from one who is absent. If you ask a living teacher a question, he will probably answer you. If you are puzzled by what he says, you can save yourself the trouble of thinking by asking him what he means. If, however, you ask a book a question, you must answer it yourself. In this respect a book is like nature or the world. When you question it, it answers you only to the extent that you do the work of thinking and analysis yourself. This does not mean, of course, that if the living teacher answers your question, you have no further work. That is so only if the question is simply one of fact. But if you are seeking an explanation, you have to understand it or nothing has been explained to you. Nevertheless, with the living teacher available to you, you are given a lift in the direction of understanding him, as you are not when the teacher’s words in a book are all you have to go by. Students in school often read difficult books with the help and guidance of teachers. But for those of us who are not in school, and indeed also for those of us who are when we try to read books that are not required or assigned, our continuing education depends mainly on books alone, read without a teacher’s help. Therefore if we are disposed to go on learning and discovering, we must know how to make books teach us well. That, indeed, is the primary goal of this book. I. There is one kind of situation in which it is appropriate to ask for outside help in reading a difficult book. This exception is discussed in Chapter 18. Dr. Mortimer J. Adler was Chairman of the Board of the Encyclopedia Britannica, Director of the Institute for Philosophical Research, Honorary Trustee of the Aspen Institute, and authored more than fifty books. He died in 2001. Dr. Charles Van Doren earned advanced degrees in both literature and mathematics from Columbia University, where he later taught English and was the Assistant Director of the Institute for Philosophical Research. He also worked for Encyclopedia Britannica in Chicago. 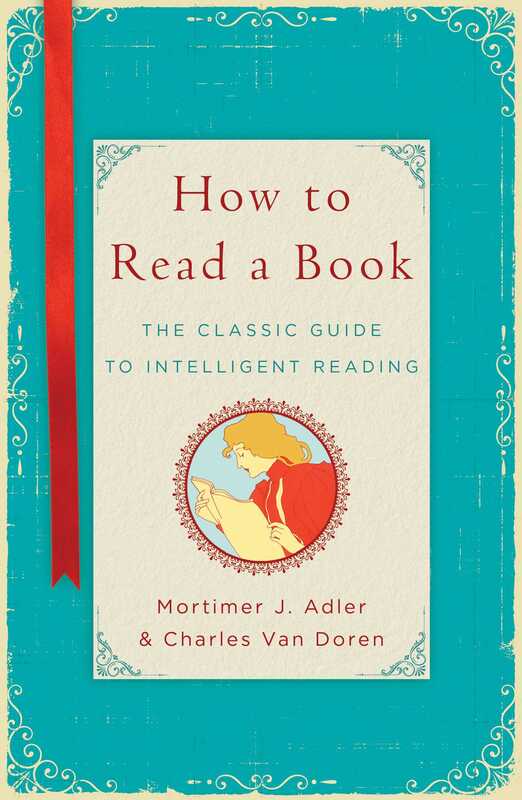 "It shows concretely how the serious work of proper reading may be accomplished and how much it may yield in the way of instruction and delight." "These four hundred pages are packed full of high matters which no one solicitous of the future of American culture can afford to overlook." "'There is the book; and here is your mind.' Adler and Van Doren's suggestions on how to connect the two will make you nostalgic for a slower, more earnest, less trivial time."